The Flash picks up during a very poignant meeting between Eobard Thawne and Nora. It’s what we’ve been waiting for– to reveal their relationship and shed light on Nora, and if she’s been entirely truthful to the team. Nora knows who Eobard Thawne is, but not his role in Barry’s life. He has helped her to visit the past and appears to be looking for something in return. Nora isn’t too keen on helping him now that she has learned more about his role the death of her great-grandmother, but Thawne doesn’t seem overly concerned by her change of heart. With Cecile returning as a prosecutor for Weather Witch’s trial, the rest of Team Flash is either on vacation or dealing with previous issues. Cisco is on the mend from Cicada’s attack and looks to be on the road to recovery. After examining him, Caitlin realizes they can use this dark matter to create a cure for Metahumans and return them to normal. Caitlin is less enthusiastic about the idea, as Killer Frost has become a fast friend of hers. However, Cisco doesn’t see a future that involves a normal life as long as he has these powers, and is determined to find a cure. They are at odds over the decision, but the appearance of a human using Meta-tech by the name of Silver Ghost interrupts their debate. Her Meta-tech, a key fob that can take control of any car, is dangerous for quite a few reasons. For example, once Barry touched the vehicle she was controlling, he couldn’t stop his phasing. It knocks Barry out of commission, having to stay in isolation to get stable. The team has to find her without Barry, but her motives aren’t clear; tracking her seems impossible. That is until she gets her hands on Weather Witch, who they know how to track her at least. Silver Ghost has this grand plan: she wants them to steal tech from A.R.G.U.S., and with this team up it should be easy. However, Weather Witch has her doubts about following in her father’s footsteps as a convict. She’s remorseful for what she has done and doesn’t want to be apart of Silver Ghost’s plan. When Nora captures Weather Witch, she holds firm in believing once a convict, and will always be a convict. It isn’t only Weather Witch she’s thinking of– Thawne is still on her mind– and she keeps her views rigid and narrow because of this. It’s not until a heart to heart with Barry does her view begin to change. A story about Snart opens her world just a little. When Nora faces Weather Witch again, she takes a chance to reach out to her, and it works. While she may have gotten away, Nora wasn’t harmed, and that meant the everything to her. The unintended consequence is she now is beginning to open up to Thawne, viewing him in the same light and deserving of a second chance. The most exciting scenes of this week’s episode were mostly from Sherloque and Thawne. Already interesting characters, watching them try to figure out their motives is more intriguing than even Cicada’s looming presence. 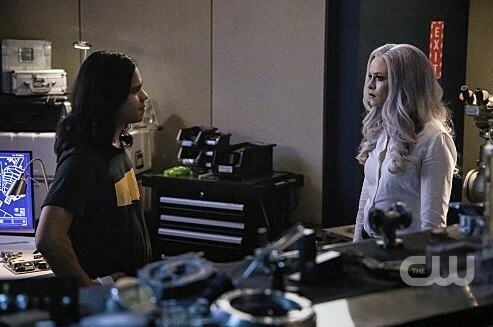 While Caitlin and Cisco walked into an interesting debate, I was hoping Caitlin would stand her ground on the issue of “curing” Meta-humans. It spells trouble and making Cisco happy will surely backfire.